Applicable For : Only Open To People Residing In South Africa. It’s the month of love and grand romantic gestures and we’re hoping this means not just some gift giving but a lot more kissing. And this month, you stand a chance of winning the kit in IOL’s #MyHeart competition. Inside the kit you’ll find all the quality tools you need for an effective daily oral care routine that keeps your mouth kissable and smile sparkling. Employees of Independent Media, the sponsors & their agents, or any company associated with the competition & their immediate families are not eligible to enter. Prizes are not redeemable for cash. The judge’s decision is final and no correspondence will be entered into. Receipt of entries will not be acknowledged. The entrant accepts that entry to the competition does not constitute a contract or any form of legal commitment between the entrant and IOL. ** The competition runs from February 1 to 28. ** Winners will be notified by March 1. ** Winners will be notified by email or phone, so please send us your contact details with your entry. ** Tell us who you love and why. The IOL team is passionate about news for the heart of South Africa and we want to hear about who holds your heart. Whether it’s the love of your life, your BFF, your cat, your mom, your boss or your second-removed cousin on your grandmother’s side, we want to know why you appreciate them so much. 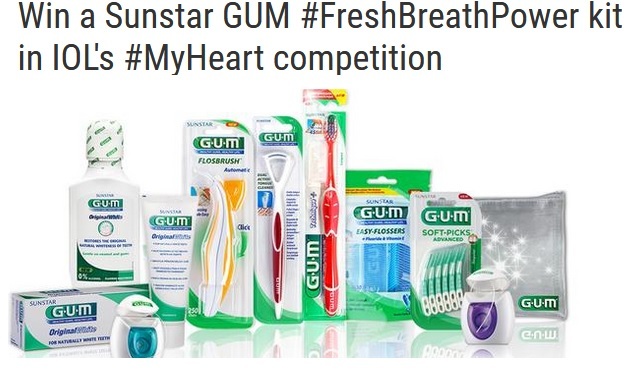 ** If you are our pick for best story of the day, you will win one of our amazing prizes, which includes the Sunstar GUM #FreshBreathPower kit for two, and be entered into the grand prize draw. ** So send an email to iolcompetitions AT inl.co.za telling us your #MyHeart story. ** You can also DM us on Facebook or Twitter, or tag us on Instagram. ** Or download our app on Android or IOS and use our MOJO feature to send us your entry. ** The more words the better, and if you have pics and videos, you can send that too. ** Selected story entries, pictures and videos will be published on iol.co.za and our social media pages. The winners’ names will be published on our website and social media pages. When you enter a competition with us, we ask for your name, email address and mobile number. We use email addresses to notify winners to let them know they have won a prize. We use the mobile numbers provided in order to contact the winner and for prize delivery.